Interference management in multiuser wireless networks is a critical problem that needs to be addressed for enhancing network capacity and developing future wireless standards. Conventional wireless devices are designed to access the shared wireless medium through various techniques which prevent devices from transmitting simultaneously, thus avoiding interference. The traditional approach of avoiding interference via orthogonal access of shared resources by multiple devices has been the most prevalent in multiuser wireless networks. Recent work has proposed the idea of Interference Alignment (IA). It has been shown that the capacity of a multiuser network is not fundamentally limited by the amount of interference. The key idea is to design the signals adaptively so that the distance between the signal and interference subspace is maximized. Theoretically, this operation can be performed by all of the transmitters in the network so that all of the links will benefit. As the number of wireless network users grow exponentially, the network becomes denser and interference becomes a serious bottleneck. While there have been several theoretical insights to apply interference alignment to various wireless network settings, there has also been parallel interest in devising practical algorithms for IA and evaluating IA in real-world scenarios. The objective of this project was to demonstrate how electrically reconfigurable antennas can be coupled with interference alignment algorithms to enhance interference management in multiuser wireless networks. Reconfigurable antennas are capable of electronically switching between different radiation patterns (or “states”) in response to the needs of the overlying communication link and network. Broader impacts of the proposed project included the mentoring of graduate and undergraduate students, a patent of the developed technology leading to collaboration with a Drexel spin-off company considering the sue of commercial reconfigurable antennas with our techniques, visualization tools for illustrating reconfigurable antennas using augmented reality techniques, and public dissemination of new antenna technologies through a high impact journal paper whose press release was featured on the front page of the NSF website as well as picked up by various news outlets. Interference management in multi-user wireless networks is a critical problem that needs to be addressed for enhancing network capacity. 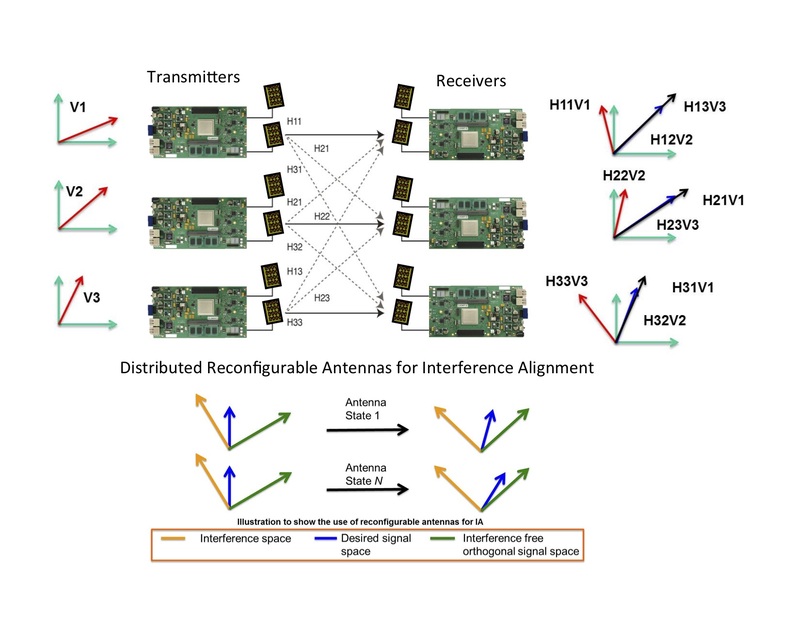 In previous reporting periods, we showed how the combination of interference alignment and pattern reconfigurable antennas can leveraged to yield significant gains in network capacity. In particular, we demonstrated how the pattern diversity offered by reconfigurable antennas can be exploited to improve sub space design for CSI based IA solutions. Subsequently, we extended previous work, and established the feasibility of and experimentally evaluated the performance of reconfigurable antenna systems for blind interference alignment. We further improved upon this implementation by using intelligent pattern selection algorithms to enhance the performance of blind IA. These previous studies motivated the need to develop a more fundamental understanding of the role of pattern diversity in MIMO systems. In particular, it is crucial to evaluate the ability of pattern diversity, through reconfigurable antenna, in creating “favorable” channel conditions for interference mitigation schemes based on linear precoding techniques such as IA and MU-MIMO. Existing work in this area has relied on simplistic assumptions about the antenna, simulation studies or limited measurements. In contrast, we develop a unique measurement methodology for characterizing the benefits of pattern diversity in a controlled and repeatable measurement environment. Furthermore, we develop efficient hardware architectures that enable us to quickly prototype different physical layer designs and run end to end performance tests on our FPGA testbed. Additionally, we also explore the concepts of pattern diversity in the 60 GHz band. By conducting careful measurements in controlled environments we demonstrate the ability of 60 GHz radios to mitigate link outage due to blockage by switching to wider beams to take advantage of reflection as a form of propagation. We also considered interference management in drone-based communication links. We demonstrated through the use of ray tracing models and realistic end-to-end simulations, how UAV communications in urban environments benefit from adaptive sub-carrier counts to combat interference effects. We are currently expanding on this work to include the reconfigurable antennas developed in this project. Using our experience through this project with building reconfigurable antennas on non-traditional substrates, we opportunistically demonstrated how a new a class of MXene material can be used to rapidly “spray paint” antennas onto different surfaces. There is strong potential to use these materials and fabrication techniques to rapidly fabricate reconfigurable antennas in the future. This high impact Science Advances paper acknowledges this project, and the press release on the paper was picked up by numerous news outlets including IEEE Spectrum, BBC News, and Smithsonian.com. It was also featured for several days on the main NSF website. Under Major Goal #1, we have shown that optimal channel selection for interference alignment can significantly improve the performance of the users in the network. We have proposed practical sequential algorithms to amortize the complexity cost and adaptively select between a combination of antenna states at the receivers. Through extensive simulations we have shown that that sum rate can be maximized and the channel selection via reconfigurable antennas add another degree of freedom to optimize IA performance even in low and mid SNR regimes. Performance analysis using a MIMO IA testbed (which also links to Major Goal #3), incorporating radiation state correlation and its impact on bandit policy design, are interesting areas of future work. Further, extending the sequential channel selection to other numerical IA techniques, such as alternating minimization, is left for future work. For Major Goal #2, we have integrated reconfigurable antennas for use with Blind IA schemes. Initial simulation results indicated a successful path toward the proposed solution. As a natural step forward, we leveraged WARPLab framework for rapid development of over-the-air measurements under this task. An adaptive frame structure has been developed to withstand any changes within the wireless channel during the experiment. Our preliminary results indicated success. This work is still in progress. We are currently working on expanding our measurements for a more in-depth investigation. As a part of our work towards Major Goal #3, we leveraged the capabilities of our in-house Drexel SDC testbed. The above goals have shown the advantages of integrating reconfigurable antennas with IA setups. There is a need for a real-time implementation of the above. As a part of this goal, we modified Drexel SDC testbed’s packet detector and antenna control modules to work with IA implementations investigated in Major Goal #1 and Major Goal #2. Under Major Goal #1, continuing from last year, we have shown that optimal channel selection for interference alignment can significantly improve the performance of the users in the network. We have proposed practical sequential algorithms to amortize the complexity cost and adaptively select between a combination of antenna states at the receivers. Through extensive simulations we have shown that that sum rate can be maximized and the channel selection via reconfigurable antennas add another degree of freedom to optimize IA performance even in low and mid SNR regimes. Performance analysis using a MIMO IA testbed (which also links to Major Goal #3), incorporating radiation state correlation and its impact on bandit policy design, are interesting areas of future work. Further, extending the sequential channel selection to other numerical IA techniques, such as alternating minimization, and over-the-air testing is left for future work. For Major Goal #2, we have integrated reconfigurable antennas for use with Blind IA schemes and shown their effectiveness by the means of over-the-air experiments. IA schemes mainly rely on channel state information (CSI) to be able to cancel interference at the receiver. Blind IA offers an enhancement by no relying on the CSI, a realistic assumption for commercial off-the-shelf devices. To leverage, reconfigurable antennas for Blind IA, an adaptive frame structure has been developed to withstand any changes within the wireless channel during the experiment. We have then designed an over-the-air experiment using WARPLab SDR implementation with customized FPGA for reconfigurable antenna support. Through experimental measurements, we demonstrated that Blind IA can indeed be realized in practice via reconfigurable antennas and our reconfigurable antenna- based Blind IA implementation significantly outperforms the rate achieved by TDMA. Also supporting Major Goal #2, we augmented our reconfigurable antenna (RA) mode selection by using learning schemes. Reconfigurable antennas can change their radiation patterns electrically to “direct” their beam in the optimal direction. This is a natural optimization problem that can be addressed by machine learning schemes. By using such algorithms, we can identify the best antenna mode that maximizes the Blind IA performance. Under this effort, we provided two reinforcement learning techniques for selecting antenna modes to enhance the performance of RA-based blind IA systems. Additionally, we used over-the-air (OTA) measurements to evaluate the performance of the selection strategies under different channel conditions. As a part of our work towards Major Goal #3, we leveraged the capabilities of our in-house Drexel SDC testbed. Specifically, we built custom FPGA modules to control reconfigurable antennas from hardware along with modified packet detectors for identifying the packet structure built for our IA experiments (part of the above bullet points). A hardware implementation is required for the speed it offers–it will enable packet processing, pre-coding, antenna mode selection within a typical wireless channel coherence time (e.g. residential scenario). Our work under this task supports both Major Goal #1 and Major Goal #2. Antenna controller and packet detector modules are built and working. However, the pre-coder module is still being worked on for integration into our IA testbed. We investigated a new wireless Physical layer security technique that leverages interference alignment using reconfigurable antennas without the need for access to channel state information, which lowers the necessary computation overhead for algorithms that use PHY-layer security techniques that need CSI. We demonstrated a successful implementation of this algorithm using our in-house built reconfigurable antennas and an Xilinx Virtex6 ML605 FGPA board. As a part of our goal towards building a testbed for IA, Drexel’s SDC testbed packet detector has been modified to work with the frame structure described. It has also been modified to allow for rapid mode selection for the reconfigurable antenna support. The final improvement allows us to expand blind IA to wireless networks with more than 2 users. A novel intelligent reconfigurable antenna switching mechanism was implemented at the receivers that takes takes into consideration the number of transmit antennas and the blind IA precoder structure. A new blind IA precoder was designed that can adapt to varying number of users, varying number of receive antennas and varying number of transmit antennas. In addition, we started to migrate our testbed design that was initially targeting Virtex6 ML605 FPGA boards to USRP X310 SDRs using RFNoC. This move will enable faster development and testing times. A repeatable and efficient measurement methodology was developed for characterizing the performance of reconfigurable antennas and physical layer processing algorithms. The measurement approach leverages a reverberation chamber for emulating various radio propagation environments in a controllable and statistically repeatable manner. Through the careful placement of RF absorbers, positioning of antennas and rotation of mechanical stirring paddles, it is possible to generate wireless channels with varying spatial (angular), temporal and spectral characteristics. An extensive measurement campaign was conducted using the aforementioned approach to quantify the pattern diversity benefits of reconfigurable antennas in MIMO systems. Using WARP v3 SDR implementation of PHY layer algorithms and commercial MIMO reconfigurable antennas, the performance of MIMO linear processing algorithms, as a function of selected antenna beam patterns and emulated channel conditions, were evaluated. An independent source signal processing architecture was developed for efficient calculations of BER on hardware. Using this approach, the source components of a transmitter and receiver both generate identical random bits independently from each other, allowing for the received data to be compared to the original bit stream. This design was implemented on a Xilinx Virtex-6 ML605 FPGA and reduces processing time by more than four orders of magnitude compared to hardware simulation techniques used in regression testing. As a result, the described technique accelerates the development and evaluation of physical layer designs and signal processing algorithms on hardware. The feasibility of beam switched antennas to mitigate the effects of blockage at 60 GHz was investigated. In particular, it was demonstrated, through VNA-based measurements, that switching to a wider beam pattern allows the link to be maintained, albeit at the cost of lower SNR, when blockage of narrow high gain beams can lead to link failure. Antenna designers working on new reconfigurable antenna fabrication techniques demonstrated how new, non-traditional, materials could be used to make antennas that can be “spray painted”. N. Gulati, R. Bahl, and K. R. Dandekar, “Learning Sequential Channel Selection for Interference Alignment using Reconfigurable Antennas,” In preparation for submission, 2019. A. Sarycheva, A. Polemi, Y. Liu, K. Dandekar, B. Anasori, and Y. Gogotsi, “2D titanium carbide (MXene) for wireless communication,” Science Advances, vol. 4, no. 9, 2018. doi: 10.1126/sciadv.aau0920. eprint: http://advances.sciencemag. org/content/4/9/eaau0920.full.pdf. [Online]. Available: http://advances. sciencemag.org/content/4/9/eaau0920. M. Jacovic, O. Bshara, and K. Dandekar, “Waveform design of UAV data links in urban environments for interference mitigation,” in Proc. of the IEEE Vehicular Technology Conference, 2018. O. Bshara, Y. Liu, I. Tekin, B. Taskin, and K. R. Dandekar, “mmWave Antenna Gain Switching to Mitigate Indoor Blockage,” in Proc. of IEEE International Symposium on Antennas and Propagation and USNC-URSI Radio Science Meeting, 2018. S. Begashaw, X. R. Rey, and K. Dandekar, “Impact of reconfigurable antennas on MU-MIMO over measurements in a reverberation chamber,” in Proc. of the IEEE Vehicular Technology Conference, 2018. J. Chacko, M. Jacovic, C. Sahin, N. Kandasamy, and K. R. Dandekar, “Independent source architecture for developing FPGA-based physical layer security techniques,” in MILCOM 2017 - 2017 IEEE Military Communications Conference (MILCOM), Oct. 2017, pp. 666–671. doi: 10.1109/MILCOM.2017.8170751. S. Begashaw, D. H. Nguyen, and K. R. Dandekar, “Enhancing blind interference align- ment with reinforcement learning,” in 2016 IEEE Global Communications Conference (GLOBECOM), Dec. 2016, pp. 1–7. doi: 10.1109/GLOCOM.2016.7841815. S. Begashaw, J. Chacko, N. Gulati, D. H. Nguyen, N. Kandasamy, and K. R. Dandekar, “Experimental evaluation of a reconfigurable antenna system for blind inter- ference alignment,” in 2016 IEEE 17th Annual Wireless and Microwave Technology Conference (WAMICON), Apr. 2016, pp. 1–6. doi: 10.1109/WAMICON.2016.7483855. M. Jacovic, J. Chacko, D. Pfeil, N. Kandasamy, and K. R. Dandekar, “Hardware implementation of low-overhead data aided timing and carrier frequency offset correction for OFDM signals,” in MILCOM 2015 - 2015 IEEE Military Communications Con- ference, Oct. 2015, pp. 495–500. doi: 10.1109/MILCOM.2015.7357491. B. Z. Katz, C. Sahin, and K. R. Dandekar, “Real-time wireless physical layer encryption,” in 2016 IEEE 17th Annual Wireless and Microwave Technology Conference (WAMICON), Apr. 2016, pp. 1–4. doi: 10.1109/WAMICON.2016.7483851. C. Sahin, B. Katz, and K. R. Dandekar, “Secure and robust symmetric key generation using physical layer techniques under various wireless environments,” in 2016 IEEE Radio and Wireless Symposium (RWS), Jan. 2016, pp. 211–214. doi: 10.1109/RWS. 2016.7444407. R. Bahl, N. Gulati, K. R. Dandekar, and D. L. Jaggard, “Reconfigurable antennas for performance enhancement of interference networks employing interference alignment,” Granted Patent US 9236955 B2, Jan. 12, 2016. [Online]. Available: https://lens. org/055-323-420-597-758. S. Begashaw, “Enhancing Multi-User Networks with Pattern Reconfigurable Antennas,” PhD thesis, Drexel University, Philadelphia, PA, May 2019. J. Chacko, “FPGA-based reconfigurable physical layer architecture for wireless applications,” PhD thesis, Drexel University, Philadelphia, PA, May 2017. D. Nguyen, “Agile spectrum-sharing wireless systems using software-defined radios and reconfigurable antennas,” PhD thesis, Drexel University, Philadelphia, PA, Aug. 2017. N. Gulati, “Online Learning for Exploiting Diversity in Adaptive Wireless Networks,” PhD thesis, Drexel University, Philadelphia, PA, May. 2015.